This blog post is going to explore some of my picks from the conference through these lenses. Security, privacy and integrity was a recurring theme of the conference. There’s no easy path forward that ordinary people can take. As a first time linux.conf.au Speaker, David delivered a solid presentation covering business continuity planning, disaster recovery planning and digital legacy. His focus was on ensuring that appropriate planning was done before business interruption events. He also covered personal digital legacy – an almost-unexplored topic – for example – would the people you leave behind when you die know how to access your passwords? George Fong (previous Chair of Internet Australia, current Deputy Chancellor at Federation University) delivered a very strong presentation which advocated for the defence of security and integrity of the internet, largely because governments and other non-technical actors in the ecosystem don’t trust the internet – the “cybers”. Using examples such as Dirty COW and Heartbleed, Fong opined that we as an opensource community need to make sure that Linux – which the foundation of the internet rests upon – is trustworthy. Bugs are only shallow if many eyeballs are on them, and all too often there aren’t enough eyeballs. Using the analogy of seatbelts, and how few of us would ever feel safe and secure driving without one, he articulated how the internet in many ways is still a frontier, devoid of strong security measures and protocols that ensure safety and integrity – and therein, trust. Touching on another key theme of the conference – agency and empowerment – he urged the audience to grasp that they, we, the open source community are the voices of the internet. Fong encouraged us to use those voices to better educate the public on what we do – we need to promote our activities to strengthen integrity. Things are broken – and we’re not helping. It’s up to us to fix the problem. On a side note, as the recently-elected President of Linux Australia, I’m looking forward to working with George, and recently-appointed Chair of Internet Australia, Anne Hurley, to identify how we can work collaboratively together on some of these aims – as Internet Australia and Linux Australia have some overlap in mission, values and remit. Nowhere is security, privacy and integrity more pressing that in the field of Internet of Things. There were several IoT related talks this year, but two that stood out. Firstly, Jon Oxer‘s talk on Network Protocol Analysis for IoT Devices was an eye-opener into the history of the radio frequency spectrum, how some of it is unregulated, but moreover how device protocols can be reverse engineered with simple equipment and a penchant for code-breaking. Oxer showed how simple it is to launch a man-in-the-middle attack on IoT devices on the RF 422 MHz band by intercepting their transmissions, decoding their protocols and then using a playback attack. We definitely need better encryption in IoT. Christopher Biggs also gave an excellent security talk around IoT – ‘How to defend yourself from your toaster‘, however he tackled it from the perspective of an IoT device manufacturer or developer – clearly articulating what features and functions should be included in new IoT devices. Although he didn’t frame it as such, his talk was basically outlining a maturity model for IoT devices. For example, devices with low maturity have poor user interfaces, no provision for maintenance, and employ poor security practices – such as having insecure protocols (such as telnet) available. He provided useful advice for improving maturity, for instance port-scanning devices to see which ports are open, and what data is being transmitted. One of the key takeaways here was that if you are designing an IoT device, or managing a fleet of IoT devices, that you need to get someone else to do the hard parts. Apple, Amazon and Google all now have SDKs available for IoT, but the drawback is that most of them are not open sourced. Biggs spoke of a metric that I hadn’t heard before in this space – MTT1C – mean time to first compromise – or the length of time it takes an IoT device to be compromised once it’s placed on the public internet. This got me thinking that I haven’t seen anywhere a capability maturity model for enterprise IoT – for instance the practices, support, metrics and continuous improvement that would be used in a large organisational deployment of IoT. Perhaps this is something that the standards bodies in this space – Open Connectivity Foundation, BITAG and Resin.io – will develop in time. Dr Vanessa Teague gave one of my favourite talks of the conference on e-voting systems, and the general problem of end to end verification. Using a number of examples of how companies have (or have not) implemented verification, she articulated a number of anomalies with current e-voting systems in NSW, which are soon to be used in both WA and Victoria. Given the recent controversy around United States elections, this talk was particularly timely, and gave rise to a number of uncomfortable questions – such as just how many votes does it take to change an election result, and possibly the course of history? One of the most resonating points within Dr Teague’s talk was the rejection of an e-voting system – V-Vote – which had superior verification capabilities, but poor user experience and usability qualities. This touches on the second theme which emerged from #lca2017 – it is not sufficient for a product, tool or platform to be functional – it must also have form. People are persuaded by the shiny – and rather than scoff at this – default behaviour for a lot of our community – we need to recognise and respond to this. Dr Teague was an engaging, humourous and articulate speaker, and I’d really like to hear more from her in future conf lineups. It may be unusual to relate user experience and customer / community experience to trust, but I see it as fitting. Our experience with a task, a process, or an interaction either enhances or erodes our trust in the organisation, platform or person with whom we’re interacting. Donna Benjamin – I am your User, why do you Hate me? Donna Benjamin‘s excellent talk aimed to bring a user experience / human-centred design element to open source developers by questioning some of the fundamental ‘defaults’ we tend to hold. Using project onboard experiences as a lens to explore how we treat newcomers, she demonstrated that our actions are turning people away from opensource – exactly the opposite effect that we’re aiming for. She outlined how contributions in triage, review and testing are not valued as highly as code contributions, again presenting a barrier to increasing participation and diversity. Benjamin argued for the open source community to see users not in terms of what they can’t do – develop software – but as people – with needs and emotions. This talk highlighted for me the lack of design thinking, human-centred design and user experience practices that are adopted not just on open source products, but to communities in general. Lowering ‘friction’ – the antithesis of good user experience – is something that both open source products and open source communities need to get better at. Rikki Endsley‘s talk likewise touched on how managing communities is a complex task, often fraught with pitfalls. The key takeaway was that you can’t change everything at once – you need to change elements of the community carefully, then have the metrics available to measure the impact of the change. VM Brasseur‘s talk was a practical guide for people working inside companies to ‘sell’ support of open source projects to management. This talk was framed along three key topics – benefits, costs and implementation. Benefits such as word of mouth marketing, stronger brand recognition, and more effective upstream support are all selling points. One of the strong points of this talk was the recognition of in-kind / non-monetary support to open source communities by business, such as the provision meeting space, marketing, guidance, leadership and mentoring. In particular, Brasseur cautioned that businesses should ask the community what it needed – rather than making assumptions – and providing, for instance, unwanted promotional goodies. Although implementation plans will vary across companies, Brasseur provided some generic advice, such as having clear goals and objectives for community support, setting expectations and being transparent about the company’s intentions. Nadia’s keynote brought to the fore many simmering tensions within the open source community. Essentially, the burden of maintaining open source software falls to a few dedicated maintainers, who in some cases may be supporting a product with a user base of tens or thousands of uses. 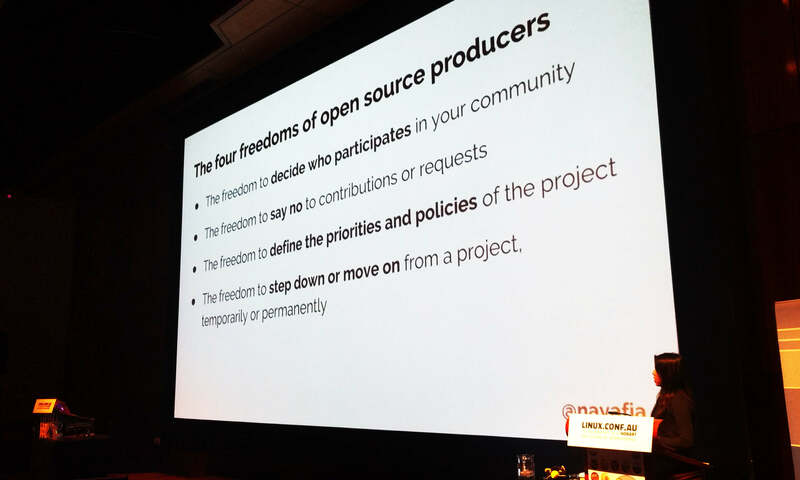 Whether these freedoms are embraced and used to support open source maintainers remains to be seen. The third key theme that was reflected in the conference programme was that of agency and empowerment – being the changes that we want to see in the open source world. Pia Waugh kicked off this theme, delivering the first conference keynote, where she gave a retrospective on human evolution, and then extrapolated this to the future of open source, articulating how we’re likely to see a decentralisation of power in order to strengthen democracy. She went on to challenge a number of existing paradigms, calling them out as anachronisms as the world has evolved. This talk was full of Waugh’s trademark energy and vibrancy, and was an excellent choice to open the conference. Dr Audrey Lobo-Pulo’s talk extended the open data movement by advocating for the public release of government open source models – financial and economic models used to assess public policy decisions – in essence, virtual worlds to explore the implications of policy. The key takeaway from her talk was that industry and business also stand to benefit greatly from the release of these models, as they could then be combined with private data – in a unique public private partnership. Lobo-Pulo put forward the four components of government policy models (shown below) – and how each contributes the accuracy and validity of the model. Karen‘s sensitive and tactful talk recognised the fact that as a community, many of our pillars and key contributors are aging, and that over the next few years we are likely to bid goodbye to many in our community. Her talk explored the different ways in which copyrights can be assigned after death, and the key issues to consider – empowering us to make informed and well founded decisions while we are in a position to do so. Few presenters could have handled this difficult topic with such aplomb, and as usual Karen’s grace, wit and wisdom shone through. Again, linux.conf.au delivered engaging, thought-provoking and future-looking talks from a range of experienced, vibrant and wise Speakers – and again it was an excellent investment of time. The diversity of Speakers this year was excellent, if perhaps erring on the non-technical side. Open source still faces a number of challenges – the ecosystem is often underfunded, maintainers are prone to burnout and we still haven’t realised that UX needs to be a key part of what we’re all about. But that’s part of the fun – we have the power to evolve just like the rest of the world. And I can’t wait for a bit of history repeating at Sydney 2018! linux.conf.au 2017 heads to Hobart, where it was last held in 2009. I absolutely love Tasmania – especially its food and scenery – and am looking forward to heading over. So, here’s my talk picks – keeping in mind that I’m more devops than kernel hacker – so YMMV. Monday 16th – Networking breakfast, possibly some WootConf sessions and / or Open Knowledge Miniconf sessions. Wednesday 18th – Future Privacy by Michael Cordover, In Case of Emergency – Break Glass by David Bell, Handle Conflict Like a Boss by Deb Nicholson, Internet of Terrible Things by Matthew Garrett. Thursday 19th – Network Protocols for IoT Devices by Jon Oxer, Compliance with the GPL by Karen Sandler and Bradley M. Kuhn, Open source and innovation by Allison Randall and Surviving the next 30 years of open source by Karen Sandler. If I get a chance I’ll see some of the WootConf sessions and/or Open Knowledge Miniconf sessions (the Open Knowledge Miniconf schedule hadn’t been posted at the time of writing). The highlight for me in Tuesday’s schedule is the excellent Pia Waugh talking ‘Choose your own Adventure‘. This talk is based on Waugh’s upcoming book, and the philosophical foundations, macroeconomic implications and strategic global trends cover a lot of ground – ground that needs to be covered. As of the time of writing, the schedule for the Law and Policy Miniconf hadn’t been released, but this area is of interest to me – as is the Community Leadership Summit. I’m interested to see how the Community Leadership Summit is structured this year; in 2015 it had a very unconference feel. This was appropriate for the session at the time, but IMHO what the Community Leadership Summit needs to move towards are concrete deliverables – such as say a whitepaper advising Linux Australia Council on where efforts should be targeted in the year ahead. In this way, the Summit would be able to have a tangible, clear impact. I’ll probably head to Dan Callahan’s keynote on ‘Designing for failure’. It’s great to see Jonathan Corbet’s Kernel Report get top billing, but my choice here is between the ever-excellent Michael Codover’s ‘Future Privacy‘ and Cedric Bail’s coverage of ‘Enlightenment Foundation Libraries for Wearables‘. Next up, I’ll be catching David Bell (Director, LCA2016) talking ‘In case of emergency – break glass – BCP, DRP and Digital Legacy‘. There’s nothing compelling for me in the after lunch session, except perhaps Josh Simmon’s ‘Building communities beyond the black stump‘, but this one’s probably too entry-level for me, so it might be a case of long lunch / hallway track. Then, it will be time for the Penguin Dinner! First up, I’m really looking forward to Nadia Eghbal’s ‘People before code‘ keynote about the sustainability of open source projects. Jon Oxer’s ‘Network Protocol Analysis for IoT Devices‘ is really appealing, particularly given the rise and rise of IoT equipment, and the lack of standards in this space. It might seem like a dry topic for some, but Bradley M. Kuhn and Karen Sandler from the Software Freedom Conservancy will be able to breathe life into ‘Compliance with the GPL‘ if anyone can; they also bring with them considerable credibility on the topic. After lunch, I’ll be catching Allison Randall talking on ‘Open source and innovation‘ and then Karen Sandler on ‘Surviving the next 30 years of open source‘. These talks are related, and speak to the narrative of how open source is evolving into different facets of our lives – how does open source live on when we do not? After the keynote, I’ll be catching Audrey Lobo-Pulo on ‘Publicly releasing government models‘ – this ties in with a lot of the work I’ve been doing in open data, and government open data in particular. After lunch, I’m looking forward to James Scheibner’s ‘Guide to FOSS licenses‘, and to finish off the conference on a high note, the ever-erudite and visionary George Fong on ‘Defending the security and integrity of the ‘Net’. Internet Australia, of which Fong is the chair, has many values in common with Linux Australia, and I foresee the two organisations working more closely together in the future. What are your picks for #lca2017?